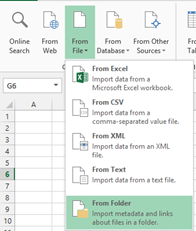 In this post we will have a look at how text (CSV) files in a folder can be combined using Power Query for Excel. In a later post will we extend this and load Excel files. Having this capability is very handy if you have files reporting on the same info (say sales figures) from different regions or multiple periods. You can keep the files as is but load them into Excel / Power Pivot as one table. 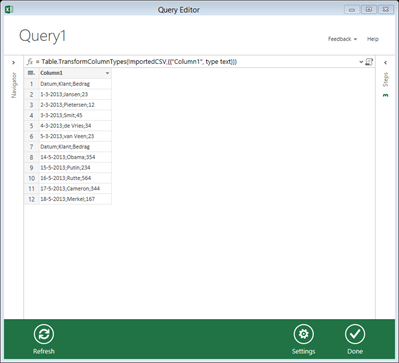 To start, load Excel and make sure Power Query is installed. 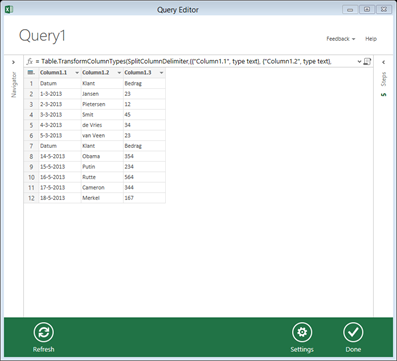 Then on the Power Query tab click From File and then choose From Folder. The information from all files in the folder is now present, but all in one column. We need to split it by right-clicking the column, and choosing ‘Split Column’ and ‘By Delimiter’. I chose ‘Semicolumn’ as delimiter and clicked ‘OK’. Now we still have the column headers from the CSV files in our set. 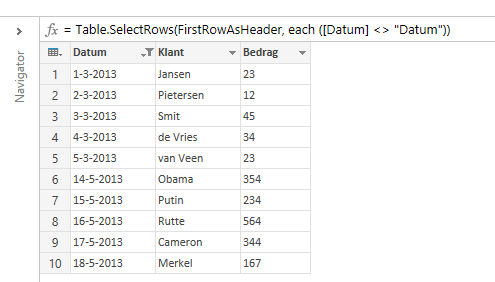 In order to use the first row as column headers click the little table icon in the top left ( ) and choose ‘Use First Row As Headers’. Click ‘Done’ and your data will load into Excel, ready to be used!